Diane Winters, who has served as the Little Brown Jug Outrider and Parade Marshal for the past 34 years, will be honored as the 2015 Lady Pace Honoree during the 2015 Grand Circuit meet in September at the Delaware County Fair. Winters will be honored in a winner’s circle ceremony after a division of the Ohio Breeders Championship for three-year-old filly pacers on Jug Day on on Thursday, September 25. Diane Winters, the Little Brown Jug Outrider and Parade Marshal for the past 34 years, will be honored as the 2015 Lady Pace Honoree during the Grand Circuit meet at the Delaware County Fair in September. for 15 years. besides the Delaware Grand Circuit meet, Winters also worked as an outrider for the Red Mile, Ohio Stair Fair and other Ohio county fairs. A native of Delaware, Winters has been a member of the Delaware County Agricultural Society Board of Directors since 1991 and served as Board President in 1995. 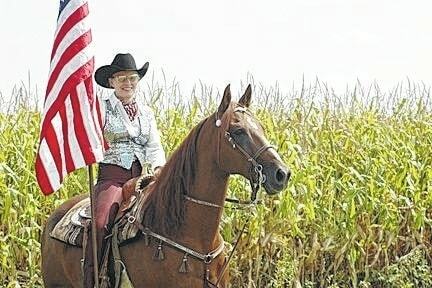 She also has been the driving force behind the All-Horse Parade since its inception 30 years ago. The All-Horse Parade is the biggest all-horse parade east of the Mississippi River. Winters will be honored in a winner’s circle ceremony after a division of the Ohio Breeders Championship for three-year-old filly pacers on Jug Day. The 2015 Grand Circuit meet at the Delaware County Fairgrounds will feature five days of racing, concluding with the 70th edition of the Little Brown Jug on Thursday, September 25. For more information or to order tickets, please visit < www.littlebrownjug.com >.